An inspiring story of animals at war, written and illustrated by award-winning author Mark Wilson. 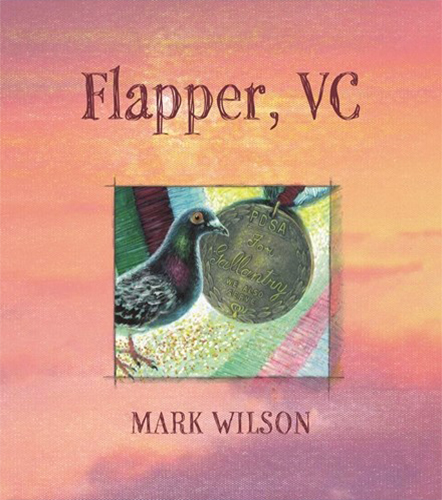 FLAPPER, VC is based on the true story of an Australian carrier pigeon during World War II. Raised and trained in Australia, Flapper is sent off to war in the Pacific. While on patrol deep in the jungle, Flapper's unit find themselves surrounded by enemy troops. With no other means of communication, the men's only hope of survival is Flapper, who has to evade enemy snipers and machine guns to get a message through to save the patrol. Flapper was awarded the animal equivalent of the Victoria Cross for his actions that day, and his medal is proudly displayed at the Australian War Memorial in Canberra. This memorable tale, illustrated with Mark Wilson's beautifully crafted and evocative artwork, is a moving story of animals in war. The Rats Of Tobruk – New Release!! !